Do I talk enough about how much I love the mayor of my village? No? I definitely do in person, so if you're missing out there, here's a little intro to Domnul Primar (Mr. Mayor). Whenever we are placed in an organization, we all have a designated partner. For me, that partner was the secretary of the mayor's office. However, I soon realized that I would consider her as more of an integration partner than an actual let's-work-together-on-stuff partner. Luckily, the mayor fits that working together role, so I consider him to be my true partner in crime. In, um.. Peace and friendship, I mean. Don't worry, we haven't committed any crimes together. Except for that time he "stole" a man's peaches on our way to the capital once, but I'm 90% sure he asked permission. He is without question, hands-down, the nicest man in the village. Possibly in the country, even. Valeriu lives right next door to his brother. He's always up for a selfie. He tells me it hurts his soul to do the hard parts of his job, but he's always got a smile on his face for the good parts. He manages to keep the whole office in line during Monday morning meetings, and if there's music playing, he's asking the first person he sees to dance. The day after my grandpa died during my first month at site, I didn't tell anyone anything, but he still managed to think I needed cheering up and took me around to all the neighboring wineries. He's pretty great at toasts and speeches (you kind of have to be here) but the sweetest one I ever heard was after one of his classmates/coworkers died. He always includes me in any village event that he can think of, and if I ask about something, he'll find some way to make it happen. I wanted to ride in a horse carriage, so he dressed me up in the national costume and, along with a bunch of others, we rode around in one for the Hram (village day) celebration. I wanted to know how to make wine, so since he wasn't making much this last year, he brought me to his brother's house to learn. I had a friend that wanted to visit the winery in the next village, so he and his wife took us for a tour! If I wanted the moon, I think he'd find a way to get it for me. This Christmas he asked me to be the Alba ca Zapada (Snow White, Santa's granddaughter) to his Mos Craciun (Santa Claus). The mayor is even famous among the volunteers in my sector. My partner was busy for our very first conference with partners, so he came along and was totally the class clown. 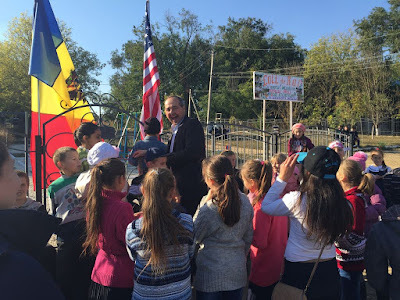 We had a number of activities where we shared things with the group, goals and objectives and such.. And he told the whole group (Peace Corps staff, PCVs, Moldovan partners) that he wouldn't let me eat or sleep until I learned Romanian. He is hilarious and always has something funny to say or a great story to tell. He makes working at the Primaria fun. I don't see him every day, because he's pretty busy and we work in different halves of the building, but if it's been awhile, he'll always come in to check on me and on whatever project we're working on. He helps me get my work done - if I ever have any questions, he's got an answer, or finds one for me. He's just so motivated! He's great to work with because he really wants to do all the good he can for the village. I think he cares a great deal about everyone here. Sometimes he talks too quickly for me, but he always realizes it (because my face shows clear incomprehension, I'm sure), laughs, and says, oh, was I talking too fast again? Catea, you've got to remind me! He's taken to calling me puișor, which technically means chick, but I swear it's cute and not weird. A term of endearment here. 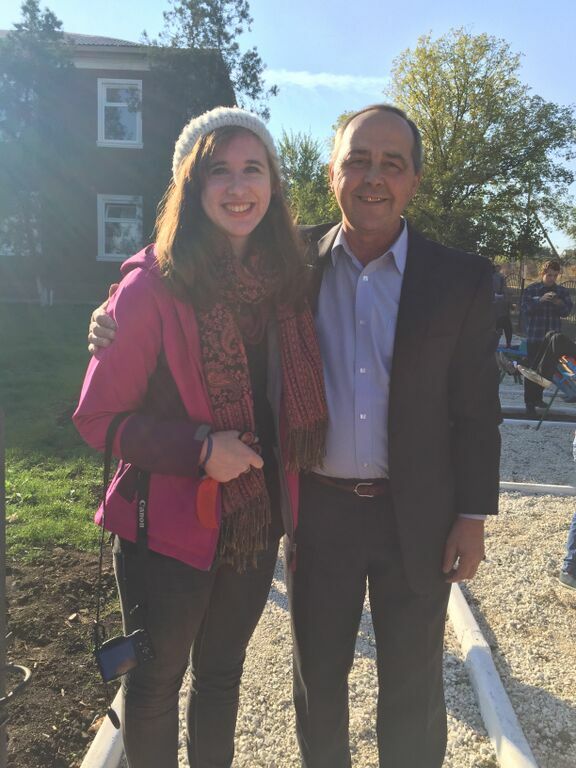 The mayor is definitely my favorite person in the village, and I'm sure he contributed to my not leaving during the time when I wanted to, just by caring about me and really wanting to work with me. He always makes sure I'm happy and taken care of, and talks about wanting to write my parents to thank them for sending me here. He makes me want to do everything I can for the village while I'm here, because if he's a part of it, I know it's going to be great.